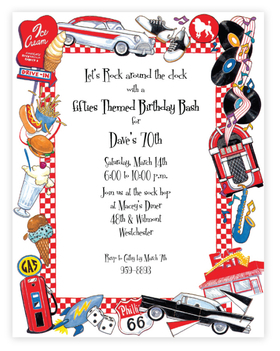 Sock hops, poodle skirts, burgers and ice cream shakes from the corner dive... it's the '50s come back to life! This bright and flashy themed paper captures the trends you know and love from your favorite decade. Envelopes are sold seperately. This is the coolest staionery print. It brings back memories of "the good old days". I couldn't find this anywhere and the delivery was very prompt! Thank you for your service! fun paper with a good design.